Dec. 8-22, 1948; "Little Nell" presented by Kiwanis Club to raise funds for their Christmas Party. A call was issued this week for those interested in organizing a Little Theater Group. Depot residents interested in acting, working on scenery, costume designing, prompting, directing, and other fields of dramatic endeavor are invited to attend a meeting at the Community Building, January 7 at 7:00 p.m. The organization is planned for Depot residents who are no longer in high school. If sufficient interest is shown, plans call for the organizing of a Little Theater Group to sponsor plays and other dramatic productions in the community. Probably one play will be produced early this spring. According to plans now under way, the Igloo Little Theater Players will present a three-act comedy at the Post Theatre the latter part of March, and the casting was completed at a meeting of the Players Wednesday. Chosen as their second production is "Palms Up", a fast-moving laugh provoking comedy with many hilariously funny situations. Sponsored by the Kiwanis Club the group has set a tenative date of March 20, for the presentation. "Palms Up", the three-act fast moving and laugh provoking comedy with many hilarously funny situations will be presented at the Post Threatre 20 March 1953. "Palms Up", sponsored by the Igloo Little Theatre Players, will be under the direction of Walrus' new editor, LeRoy (Red) Holst. Iglooites, other than those connected with the Little Theatre Players, may enter the limerick contest. The nine winning limericks, selected by the contest judges will be run on the 2, 4, 6, 9, 11, 13, 16, 18 and 20 March editions of the Daily Bulletin; and in the Walrus on 6, 13 and 20 of March. Winners will receive a complimentary adult ticket to "Palms Up". No person will be credited with more than one win. If you wish to enter the contest, complete the last line of the following limerick and leave it at the Community Building with the hostesses, Mrs. Ted Barney, Mrs. Martin Hanna, Mrs. William Krantz or with "Speed" Deimer, Chairman of the Limerick Contest. "Palms Up", the second presentation of the Litlle Theater Players, was well received by the small but enthusiastic Igloo and Edgemont audience last Friday night at the local theatre. Musical numbers between the acts with the high school swing band and the vocal duet - Carol Joslin and Delores Miller - were received with tremendous applause. LeRoy Holst, play director, said, "The successful production of the show was as much due to the entire efforts of those painting the scenes as the members of the cast. Mrs. Clara Kennaley, stage manager, and her assistants, Jim Stransky, Dave Kennaley, Lyle Blare and Rudy Ladner," he said, "were to be commended for the entire efforts of preparing props and scenery and having them in readiness for the show." Staff make-up was under the supervision of Mrs. Clara Kennaley, Lois Hagen and Ann Roberts. Mr. LaVerne Breen directed the popular candy sale between the first and second acts. Her assistants were Rev. Robert Rosenau, Ronald Backer, Frank Martinez, Charles Canfield and Woodrow Hipsher. Responsible for the prizes connected with the candy sale were Lois and Ronnie Hagen. Ushers were Ruth Cronk and Clare Ek. 1954; spring; president, Ann Roberts; "They Went Thataway"
Vol. III, No. 51; Dec. 17, 1954; pg. 6; Curtain Falls On 'My Husband'; Igloo's Little Theater's traipsing thespieans answered their final curtain call, of their four town presentations of the production "To My Husband", last Saturday night when they played to an appreciative audience at Ardmore. The "To My Husband" cast of Skippy Zink, Lu Breen, Pearl Tofflemire, Jim Stransky, Delores Anderson and Donna Stransky directed by Ed Hall, ably assisted by Pat Lachelt and Leah Zink, presented their stage show to a combined audience of approximately 750 who showed their enjoyment of the hilarious three-act comedy by demanding numerous finale curtain calls. The premier showing of this Igloo's Little Theater's production rated tops at Sanator followed by its appearance at Igloo and later at Oelrichs and Ardmore. Other members of the theater group responsible for the success of the 19954 season, and this latest production are; DeWayne Lachelt, Mary Hoel, Ruth Graybeal, Clara Kennaley, Dave Kennaley, Joanne Crellin, "Speed" Deimer, Jeanne Miller, Lucille Straub, Dorothy Mace, Luther Mace, Arleigh Farrell, Dorothy Farrell, Ben Tofflemire, Richard Zimmerman, Arlene Zimmerman, and Lois Hagen. To Bill Anderson goes thanks for the use of the Post Theater and to Ray Alley for his photographic contributions used in connection with the season's publicity. 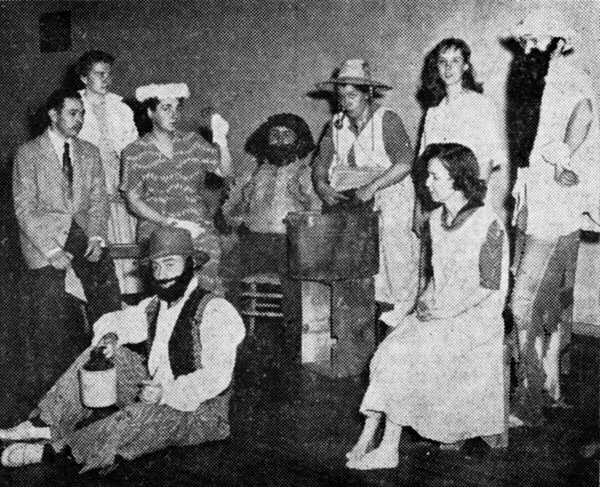 1957; spring; president, Bill Polzine; "Ma Branningan's Shinanagans"
Ed Hall, director; Karen Breen, Luella Siebrands, Marilyn O'Neill, Dorothy Farrell, Eleador Olivas, Alford Talbott, Charles Swanson, Jackie Faulkner, Russell Tofflemire and Stanley Tinsley, cast; Lu Breen, assistant director. 1957; fall; president, LuVerne Breen; vice-president, Ed Hall; "The People vs Maxine Lowe"
Stars of Tommorrow amateur show. TRYING ON THEIR "Goin' to Sunday meetin' duds" last week was the cast of "Ma Branningan's Shenanigans". The three-act hillbilly farce will be presented here next Wednesday at the Post Theatre. Left to right in the circle are Eleador Olivas, Marilyn O'Neill and Luella Siebrands. new outfit except for shoes.